My kids art works have always been really precious to me and painting drawing and arts and crafts are an important pastime in our house. I love my children to be creative. I have to great big art folders where I keep the occasional pieces they make. I would need a whole storage barn if I was to keep the lot. I do worry though that even in these art folders they will get crumpled and worn and torn. I have always fancied a laminator to protect them. I often look up crafts on the Internet and they often call for laminating from pressing floes to making suncatchers laminating is useful. If you were a cook I suppose it would be like missing a cake tin you really could do with. Without a laminator I have always felt a bit lacking as a creative mum. This retails for about £115. Its great quality. years ago I had one from a supermarket that kept getting jammed and it crinkled didn’t stick properly etc. This is so smooth and easy. I have been making the kids drawings into place mats, making bookmarks, planning tree decorations and tags etc. etc. My children are loving this extra addition to our crafting. Fellowes have developed a new online and free to access Ideas Centrewhere visitors can download, print and laminate ready-made materials at home. Fellowes is offering one of its laminators to those who submit their best laminating idea via the Ideas Centre. 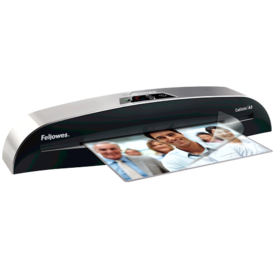 Email Fellowes at impressions@fellowes.com explaining what you would laminate if you had a Fellowes laminating machine. Please make sure you include a valid email address. Oh I miss having a laminator. One of my favourite things in school. We had an old fashioned guillotine too. Great for stress relief! Off to enter the comp now.